Cleveland blew a 21-point lead and has now lost 14 of 21, as Isaiah Thomas airballs 3s and the team's defense remains porous. If you weren’t worried about the Cleveland Cavaliers entering Tuesday night’s game against the Orlando Magic, you sure as hell better be worried now. The Cavs blew a 21-point lead Tuesday and wound up losing 116-99 to a Magic team with the second worst record in the Eastern Conference. Cleveland was outscored 65-31 in the second half, including 24-9 in the fourth quarter and has now lost 14 of its last 21 games. We could spend all night dissecting what went wrong for the Cavaliers (they let Jonathan Simmons score 34 on them for chrissakes! ), but let’s focus on Isaiah Thomas, the point guard who was supposed to be Cleveland’s savior but has instead become the team’s biggest problem. Thomas shot 3-of-13 Tuesday, including 1-of-6 from 3-point range and has now hit only 5 of his 34 shots from behind the arc over his previous seven games. Essentially, the two-time All-Star is broken. 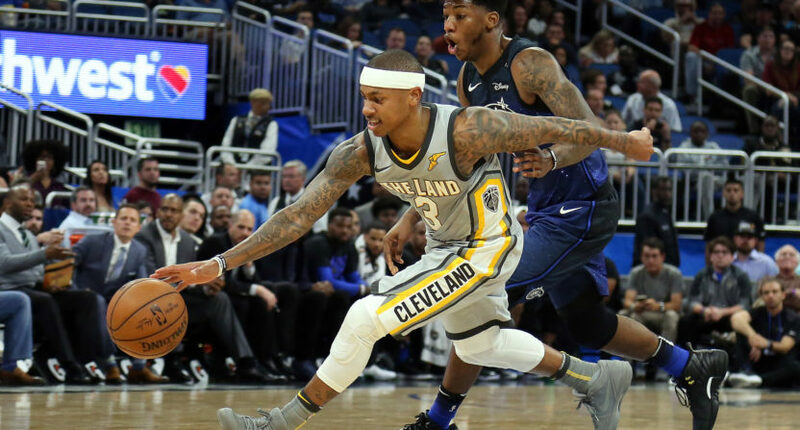 Things were going quite poorly for Isaiah long before Tuesday night — he entered the evening shooting only 36.4 percent from the floor this season while playing his usual unimpressive defense — but his performance against the Magic feels like a turning point. Whether because he’s not fully recovered from his hip injury or because he doesn’t fit Cleveland’s offense, this simply isn’t working. The Cavaliers seemingly need to stick Thomas on the bench for a little while he finds his shot or even explore a trade. Sure IT wouldn’t return anywhere near what the Cavs gave up to get him last summer, but at some point he becomes a sunk cost. He truly might have more value to Cleveland as an expiring contract than he does as a point guard. For a team to have a bad day on defense once in a while is one thing. For that team to have six awful days on defense in a three-week span is another. Yes, we’ve seen LeBron James’ Cavaliers hit another gear in the playoffs before, but this is more than just a question of effort. The Cavs rank right next to the Suns and Kings among the worst defenses in the league, and the guy who was supposed to be their second best player can barely hit the backboard on his jump shots. These are not problems that a good trade deadline can solve nor that superhuman Playoff LeBron can cover up. The Cavs are in serious, serious trouble.